This is another problem-solving piece of furniture. This time the problem was not where to eat but where to compute. PCs are a necessity of modern life, even one as minimalist as mine, but they are not attractive and are certainly not conducive to the overall Shaker decor that I have been aiming for. I finally decided on a solution that might or might not work so I also hedged my bets by designing a dual-purpose item. Outwardly this is a Shaker-style chimney cupboard similar to many others. It is made of local white pine which I milled. The sides, back, and doors are of frame-and-panel construction, the panels being a rather thin ⅜-inch due to the necessity of resawing the stock from 1-inch rough boards. There is a slight taper down to ¼-inch on the inside of each panel to allow them to fit into the frame. The design is a little "fatter" than is typical for a chimney cupboard but that was necessitated by the intended use. The secret that the cupboard hides is that the entire inside is fitted out as a frameless European-style cabinet with 32mm boring. What appears to be a faceframe from the outside doubles as a door and is hung on heavy Grass hinges that allow it to swing 167-degrees to give full access to the interior. Under the monitor shelf there is a keyboard shelf on full-extension ballbearing slides. All of the front-to-back shelves have large cutouts in the rear for ventilation and cable access. The bottom and top of the cupboard have large expanded steel inserts to give good ventilation for heat dissipation. The monitor and laser printer both operate in a powerdown mode and this minimizes the amount of heat generated when the system is idle and the door is closed. By the way, the two "normal" doors within the big door are fully functional. 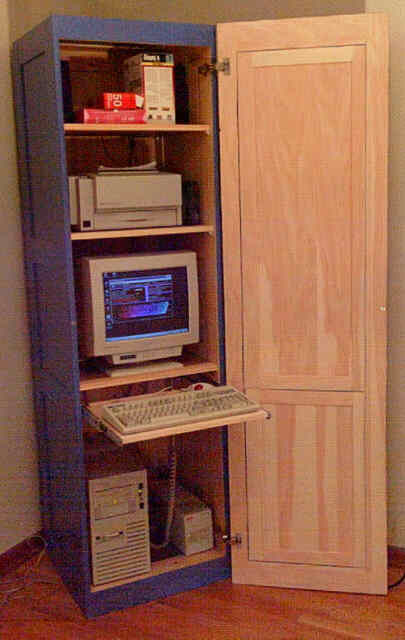 If the time comes that I don't want or need to camouflage a large PC system, the cupboard was designed for conversion. By replacing the metal grid top and bottom, placing some fixed shelves, removing the pullout and hinges, and fastening the faceframe to the carcase permanently the result should be a passable "antique" pine cupboard. The exterior finish is federal blue milk paint and the inside is simply sealed with blonde shellac so as not to conceal the construction details. The turned pulls and turn-latches on the small doors are cherry. Overall size in inches: 22 X 22 X 80.